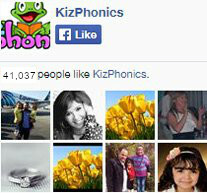 Kiz Phonics is a direct systematic phonics program, which uses an eclectic mix of analytics, analogy and synthetic phonics methods to develop literacy skills in children at an early age. All phonemic lessons are not created equal. Therefore, a methodology that employs a variety of teaching techniques is a winning formula. Kiz Phonics provides a variety of resources that reflect this eclectic approach to teaching phonics. So what is in the Kiz Phonics eclectic approach? Analytic Phonics: With analytic phonics, children are taught whole words and later analyze letter sounds in these words. One way of teaching using this method is to present words with similar letter sounds and have learners focus on the common sound. For example, the words – bat, ball, bell, book are taught. The learner analyzes and concludes that they all start with letter ‘b’ and make the sound /b/.